If you are willing to help translating cstimer into your native language, please go to https://crowdin.com/project/cstimer and select your language. If your native language is not on the list, just contact me and I'll add it. 1. Now you are able to login by your Google account and export/import your data to/from google server. CSTimer use Google drive service to store your data in your own Google drive space (in a hidden application directory according to Google's policy.) In current implementation, once the data is uploaded succesfully, it won't be deleted forever. I'll try to develop another tool to manage the uploaded data, since Google does not allow people browsing or editing their application directory. 3. Add Redi cube scramble in MoYu's notation and scramble algorithm. As shown in the picture, you are able to login with your WCA account now. When you click on the WCA area, csTimer will redirect to WCA website for your authorization. After authorization at WCA website, you are able to upload/download data to/from the server of cstimer using your WCA account by clicking "Import from/Export to server (WCA Account)", as shown in the second picture. Note: All data are stored on the server of csTimer. WCA authorization is only for identification. Note2: Import/Export functions are NOT automatically executed right now. So you must upload/download your data MANUALLY as conventional import/export functions. Note3: Although data are saved on the server of csTimer, we will not collect any personal information of your WCA account, include name and WCAID. Note4: The authorization procedure as well as the import/export procedure might fail due to several issues, e.g. network or server crash. We are trying our best to make it robust. 5. multi-phase timing settings are saved in sessions by default. Hence, it will be automatically adjusted when switching sessions. Notice: https://cstimer.net/new/ will always be the latest version of cstimer and synchronized with the source code, while https://cstimer.net/ is considered as the main version of cstimer. Customizable statistical indicators. Now you are able to statistical indicators calculated, which is mo3, ao5, ao12, ao100 by default. You can set it to any values you like, e.g. mo5, ao25, ao30, ao42, mo100, ao10000000, etc. See "Options -> Statistics -> Statistical indicators." Add Redi cube scramble. Since I do not have plenty of time to write a random-state scrambler for Redi cube, it only generates random-move scrambles. Add scramble image for clock and megaminx. Then, scramble images of all wca events are available now. Fix multi blindfold scrambles and clock scrambles. The time list is inverted, e.g. the average label is displayed at first, with the latest time next to it, and then the second latest time. Only 50 values are displayed by default. Even though, when you scroll down to the end of time list, the next 50 values will automatically loaded and displayed. In this way, cstimer will not get frozen due to time list loading during conventional solvings. We optimize the mobile user interface of cstimer. The statistics area and time list area are displayed in the same row, then they won't cover the current time displayed behind them. The "option" and "about" dialog are optimized. We add huge amounts of color schemes at "ABOUT -> Color Schemes", totally 99 different color schemes. Most of them are collected from Internet and the uploaded data. 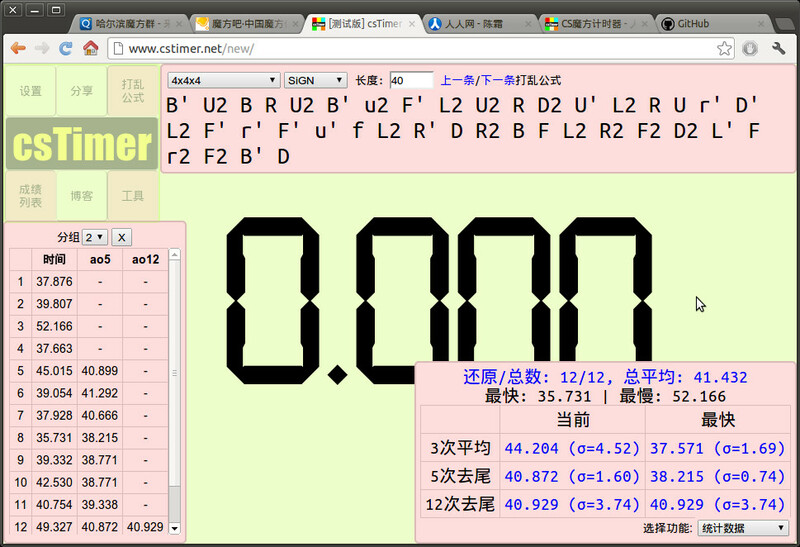 The calculation duration of 3x3x3 scramble and SQ1 scramble are optimized. We add a simple scramble cache. In previous versions, cstimer will generate scrambles immediately when you finish timing, which might cause a tiny UI freezing. 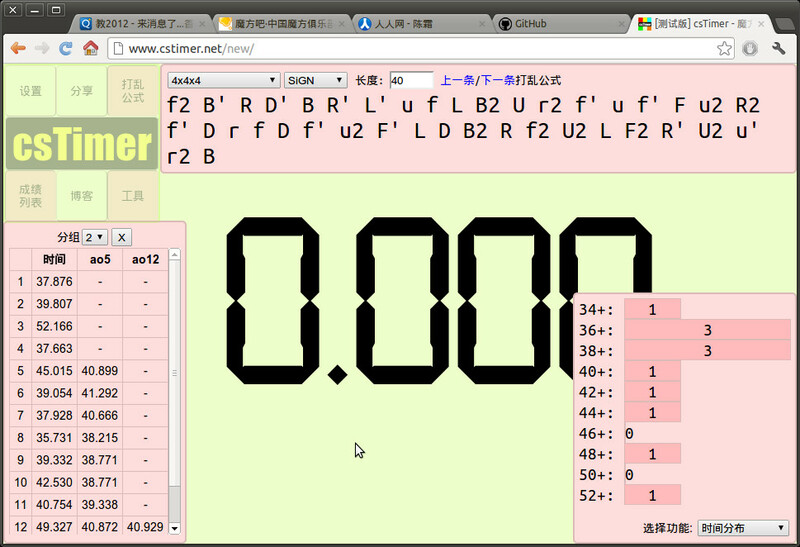 While in the latest version, cstimer will cache one scramble, and when you finish timing, the cached scramble will be displayed, and the generation of the next scramble will be executed a moment later. The calculations of the statistics are optimized. If you only append values to the time list, the whole update of all statistics data are extremely fast even when you have huge amounts of values. According to my test, even you have 100,000 values in your time list, the calculation duration is less than 0.05 seconds. However, if you did some modification on the time list, the calculations are much slower, e.g about 1 seconds in a session with 50,000 values. We decide to use IndexedDB as the storage of the session of cstimer due to the limit of localStorage. According to the documentation, the storage quota of localStorage is only 5MB, which only supports about less than 50,000 values. Instead, the storage quota of IndexedDB is dependent on your disk size, which can be considered unlimited. I've just committed an update. There isn't any functional changes in this update. The only difference is some details of the interface, especially the adaption for mobile devices. Detailly, if you open cstimer on a screen whose width-to-height ratio less than 5/6, cstimer will switch to mobile version automatically. Furthermore, the size of the timer will automatically adjust according to the resolution of your screen. Hence, cstimer almost looks the same no matter you are using a 1366x768 screen or 3840x2160 screen. As cstimer is designed for 1366x768 screens before, you will find that the statistics bar, the scramble bar and the font size is much larger than previous versions on a 1920x1080 screen. If you wanna have smaller or larger statistics bar, scramble bar and font size, you may adjust "Options -> display -> Zoom" according to your habit. If you don't like it, you can disable it via "Option->Statistics->show summary before time list"
A simple synchronization function is supported. As shown in the image, when you click "Export to server" and input your account (without any password or authentication), all your data will be uploaded to the server of cstimer. And when you click "Import from server" at some other devices with your account, all uploaded data will be downloaded and imported. 1. The account id is the ONLY identification, anyone else can upload/download/edit your data if he gets your account id. 2. All data transmitted have not been encrypted, which means your data might be captured by third party. Some optimization for the case of huge amounts (e.g. 1000+) of values. Then, the statistic tool is about 100x faster. Once it spent several seconds for calculation if you have 1000+ values, but now, several milliseconds. Now you can delete multiple values immediately. When you click the "X" button of some values, cstimer will ask you the number of deleted value. And then, these values started from current index will be deleted. As shown in the picture, if you input "1"(of course the default value), only the value "3.14" will be removed. And if you input 2, "3.14" and "0.36" will be removed. And if you input a number no less than 5, all values will be removed. It works well on most of the modern browsers, e.g. iOS Safari, Opera Mini/Mobile, Android browser, Blackberry browser, Chrome/Firefox for mobile, etc. The session function is enhanced. Firstly, you are able to create, delete and rename sessions, which means that the number of sessions is unlimited now. All data, include all sessions and all settings, can be exported now. The exported data which will be saved as a single txt file. And you can import the data from the exported txt file of course. Notice: Once you import the data from exported txt file successfully, all of the settings and sessions will be covered by the imported data, and then the page will be reloaded. Now you are able to rename your session names by clicking the "Session" string. Use smaller font after the decimal point. If you don't like this, you can disable it at "Option" -> "display" -> use small font after decimal point. Add scramble generator. Now you can generate several scrambles at once. Add color settings. The color scheme of cstimer can be customized like qqtimer now. - support stackmat II and stackmat pro(it might not work quite well.) ARGS -> timer -> entering in times with "stackmat"
- integrated with twisty.js(virtual rubik's cube like hi-games.net), and all 3x3x3 scrambles are also available, which means that you may practise last-layer scramble with it. ARGS -> timer -> entering in times with "virtual"
2. Speeding up initialization of 3x3x3 random-state scrambler/solver. On my laptop, cstimer spends 200ms on initialization while qqtimer spends 500ms. 3. You might use keyboard shortcut to switch scramble types, session, also to remove all session or the latest time in the session, etc. see "ABOUT" document. The function of cstimer is quite like qqtimer, but actually, most part of it is different from qqtimer except statistics details and scramble. As you see it almost impossible to rewrite such scrambler as qqwref although I did do many modifies indeed, for example not all scrambler initialized at its launching thus saves memory, initialization time. a) cmll, lse, zbll, cll, ell scramble is available now. b) if the 3x3-random-state solver finds solution in 50ms, it'll continue finding shorter solution(s) until time over (50 ms). This makes 3x3 subset scramble(such as last layer, zbll, etc.) much shorter. c) fast sq1-random-state solver released. Bug #1: I'm getting server error when I attempt to load the page. I really like the cross solve; that would be a very good function for those who are looking to get their cross near-optimal. The speciality scrambles are very slow; otherwise I might give this scrambler a chance to generate scrambles for my LL comp. If you can speed it up, that would be good. The layout is better than qq, but the speed of the scrambles being generated would make me sway towards qq. Maybe it would be worth releasing this as a downloadable timer, to speed it up. This timer definitely has potential, though. It loads fine for me. Which browser are you using? Looks like a qq copy I think I will stay with qq. I love it. New main timer. Very interesting interface. I think I'll try it for a bit. Wow, I love that you can have up to 10 stages; that could be really useful. But, I had refresh the page a few times before it loaded. It was just a blank page. I am using Firefox. Love how I can break down my BLD solves into all four parts now. yup me too. and i'm using firefox too. But now it's working great! I love how this timer looks and how you can click the times to see the scrambles, and click the number to delete. Overall, I love the interface and I'm definitely gonna use this timer from now on. Great job! I love this timer but I have one question. Is there an average of 100 function? Oh! Now I love this timer even more! Thanks! I like/use this timer way more than qqtimer, I like it a lot!